A spectacular golden Macedonian funerary wreath dating back to the 4th Century BC has gone on display at the National Archaeology Museum in Greece. The wreath was returned to Athens at the weekend by the Getty Museum in Los Angeles after a 10-year battle to prove it was illegally excavated and sold. 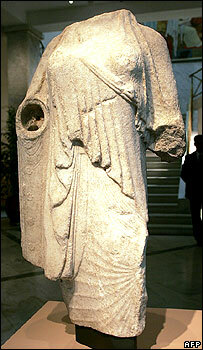 It went back, along with a 6th Century BC marble statue, as the second stage of a deal to return four stolen items. A former Getty curator has been charged with trafficking stolen antiquities. Marion True, who resigned from the museum in 2005, is facing criminal charges in both Italy and Greece over a series of artefacts bought between 1986 and the late 1990s, including bronze Etruscan pieces, frescoes, and painted Greek vessels. She has denied the charges against her. 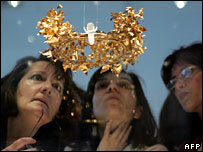 The golden wreath is one of the most exquisite treasures in Greece, the BBC's Malcolm Brabant reports from Athens. It is a floral crown of realistic leaves and flowers made of gold foil attached to a slender headband 28cm (11in) in diameter. It was probably made after the death of Alexander the Great and worn on ceremonial occasions. Experts believe it was buried with the remains of its owner in northern Greece. The Getty Museum purchased the wreath from a Swiss dealer in 1993 for just over $1m (750,000 euros; £500,000). Last year, the Americans finally agreed to return their prized possession after the Greeks convinced them that it had been illegally excavated and smuggled out of the country. The Getty's director, Michael Brand, told the BBC that everyone was saddened to see the wreath leaving, but that returning it to Greece was the correct action to take. A 5th Century BC engraved funeral marker - a stele - and a marble votive relief dating from about 490 BC were returned in August. As the wreath and statue of a woman's torso went on display in Athens, Greece's Prime Minister Kostas Karamanlis used the event as a platform to renew Greek calls for the Elgin (or Parthenon) Marbles to return to Athens. Standing between the two treasures, Mr Karamanlis said that the return of these artefacts would strengthen calls for the return of the Parthenon marbles. The marble frieze which once adorned the Parthenon Temple on top of Athens' Acropolis were acquired by Britain's Lord Elgin 200 years ago. The British Museum insists the transaction was legal as he obtained permission to remove them from Greece's then rulers, the Ottoman Empire. Athens' corrosive smog and acid rain has also been cited as a reason not to return them. But a new climatically controlled Acropolis Museum, with an entire wing set aside for the Elgin treasures is due to be completed soon. Mr Karamanlis said that Greece had now fulfilled all the conditions for the Marbles' restitution.